What did Jesus actually say about gay people? Hypocrisy was an issue that came up time and again during Jesus’ teaching.He really didn’t like it. Here’s a nice protestant overview of hypocrisy and what Jesus thought of it. The only direct reference that Jesus made to homosexuality was in Matthew 19, where the disciples were wondering whether it would be better not to marry if you couldn’t divorce your wife. He explained reasonably and quite scientifically that some men cannot marry a woman because they were born that way,others because men made them that way, and others do not marry for the sake of the Kingdom of Heaven (for example Catholic priests). I’m no bible scholar or theologian, but it does appear that Jesus is saying if you’re a gay man, you’re not obliged to marry a woman, and therefore keep his teaching on divorce, which is very reasonable. Please note he didn’t take this opportunity to take a swipe at gay people. When Jesus taught about loving your enemy he said If you love those who love you, what reward will you get? Are not even the tax collectors doing that? It would appear that Jesus viewed people who work for the tax office as far worse examples of poor lifestyle than gay people (little joke there, but my point is serious.) Also, I don’t recall any people being cured for homosexuality, and let’s face since Jesus raised the dead, if homosexuality was something that needed to be cured, he do that at a glance, looking in the wrong direction.Since God gave us logic, it’s fair now to use some cold hard logic to look at Christians who persecute gay people. As a hetero sexual I’ve never had to make a choice about being a heterosexual. No choice needed, that’s just how I am. I like it, I love my wife daughters, all good) I assume other heterosexuals have never needed to make that choice( it was never something that came up in personal development at high school– oooh – now is the time to make the choice between being straight or gay). The only scenario I can envisage where one might have to make a choice about sexual orientation would be if one was bisexual.Since many Christian bigots argue that gay people have made a choice to be gay, that can only mean that they themselves are bisexual and made the choice to be straight. However it also means if they’re heterosexual , and didn’t have to make a choice to be straight, and they then persecute gay people on the basis that those gay people made a choice, it makes those hetero sexual Christians, hypocrites. Now what would Jesus think about that? Posted in Catholicism, Thoughts | Comments Off on What did Jesus actually say about gay people? Did Pope Pius XII do enough to help Jewish people during the Holocaust? I started school in 1977, but the horror of the Holocaust 30 years earlier was still very much in the public consciousness. I remember as a child watching movies and documentaries, shocked and traumatised that the Nazis could unleash such terror and cruelty across Europe. The images of concentration camps,and mass murder were deeply etched into my mind, and remain there to this day, As a secular Catholic I had this vague notion that The Church didn’t do its bit, and left it that, but when I was called back into faith, the notion of The Church not being guided by one of its founding principles of loving thy neighbour, so beautifully explained in the parable of the Good Samaritan, made me feel very uncomfortable. 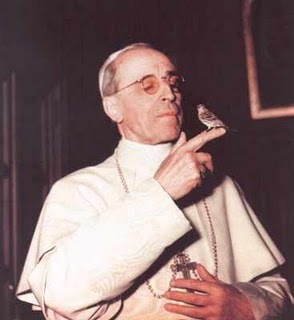 I’m no historian, and this post is purely for myself, I pose the question to myself is it likely that Pope Pius XII did everything a reasonable pope could do to save lives during the Holocaust. If you search the web, you’ll find some who claim he saved up to 800,000 Jewish lives, and my aim isn’t to join the argument, but by using Jewish sources and cold hard logic, make call. "Being a lover of freedom, when the revolution came in Germany, I looked to the universities to defend it, knowing that they had always boasted of their devotion to the cause of truth; but, no, the universities immediately were silenced. Then I looked to the great editors of the newspapers whose flaming editorials in days gone by had proclaimed their love of freedom; but they, like the universities, were silenced in a few short weeks. . . .
"Only the Church stood squarely across the path of Hitler’s campaign for suppressing truth. I never had any special interest in the Church before, but now I feel a great affection and admiration because the Church alone has had the courage and persistence to stand for intellectual truth and moral freedom. I am forced thus to confess that what I once despised I now praise unreservedly." Second, Did the Church do anything to save Jewish lives? For this I’ll rely on a Jewish source that is critical of Pope Pius (written by Shira Schoenberg for The Jewish Virtual Library). For myself I’ve established that The Church was fiercely against the persecution of the Jewish people, according to Albert Einstein. I’ve also established that Pope Pius did take action, and given that there were 477 Jewish people living at the Vatican, he would have been reminded daily of what was going across Europe. Third, I’ll use logic to answer the third question – did he do enough? Given that he did take some action, and assuming that he was sound of mind, you can justifiably extrapolate, that he would have taken every reasonable action to save Jewish lives. by reasonable I mean that, the action would likely lead to benefit rather than harm. An unreasonable action, for example, would be one that would likely provoke Nazis into retribution. An entire Czech village Llidice unfortunately found that out the hard way, through no fault of their own. Another way of asking the same question,is if Pope Pius XII was saving Jewish lives,why wouldn’t he save more if more benefit than harm would arise from his action? Pope Pius XII was a man in a very difficult position, There was uncertainty with every move, and people’s lives were at stake. Personally I’m satisfied that he did take every action he believed reasonable to save Jewish lives. Posted in Catholicism, Thoughts | Comments Off on Did Pope Pius XII do enough to help Jewish people during the Holocaust? I have great admiration for Richard Dawkins, a notable intellectual (one of the top three in world according to the back cover blurb of The God Delusion). Not every man has the intellectual dexterity to passionately write books about things that don’t exist..Not every intellectual that preaches science above all things has the intellectual flexibility to construct an argument based on random anecdotes about things he happens to dislike. Not every intellectual has the fortitude(or perhaps coldness) to argue against something that means something to people without replacing it with something better, or at least equal. As a man of science, Dawkins will be aware of the state of neuroscience, and what it theorises about human consciousness. Basically it comes down to this (and read this book it’s fascinating). Science tells us that human consciousness is a delusion. We don’t actually have free will, everything we do is determined by a biological computer (our brain), and then we’re deluded into thinking we’re making the decisions.I am aware of the theories about quantum mechanics and consciousness, but I’m sticking to orthodox science for this post. So think of this - Richard Dawkins, as a high priest of science, is a man who must be completely aware of his own deluded state.This deluded creature then writes about the ultimate delusion of all. How completely absurd – but wait it could better. Given that Dawkins has a penchant for writing about delusions, it’s quite a logical speculation that his next book could be “The Self Delusion”, where in effect a delusion is writing about its own delusion. Ching ching, I think that qualifies as a paradox. Thinking about all these delusions has given me an idea for my next book – the Science Delusion (though I do admit that science is useful for some things, it’s not useful for all things.. I was tidying a drawer full of old CDs when I came across one labeled “Music for a late night”. Finding that CD took me back several years to when my then business partner Tom and I had a small office in the beachside Sydney suburb of Coogee, where we put together our magazine FREE ACCESS. I created the CD to have something to listen to when we were working late into the night to meet a deadline. It was eclectic collection of music, everything from Pink Floyd to Nirvana to Lou Reed. Somehow, without fail, Tom and I always found ourselves working on the two weekends before the magazine went to the printers. Often on the second weekend we’d work right through the nights in order to meet our deadline. It would take us at least a week to recover from the stress and the sleep deprivation. Our little office was above a chemist shop. It had just enough space for a large desk for Tom and myself, and a separate desk for our assistant Julieanne , who by the way, rightly, worked nine to five, weekdays. Our office had no windows, so that while we were located in one of the most scenic areas of Sydney, most of our days were spent within the confines of our small office under an electric light. On those late nights when Tom and I toiled behind our computer screens, it was almost like being in a cocoon that separated us, or maybe protected us, from the drunken revelers partying in the nearby pubs and clubs. That’s probably a good metaphor for the world that Tom and I created, where the magazine was our own madly compelling, but somewhat limited cocoon, that all at once broadened our horizons, and also narrowed them. In time we came to see that our vision was flawed, and no matter how hard we worked, we would never get to where were we really wanted to go. Having said all of that, and notwithsanding how demanding those times were both physically and mentally, there’s something about those late night marathons I still miss. It’s hard to put my finger on exactly what that is exactly; perhaps it was the camaraderie, a shared sense of destiny, or maybe it was just the comfort of being in a cocoon. Now that I reflect on that time of my life, I have mixed feelings. On the one hand going into business with Tom was one of the greatest adventures of my life. On the other hand, I can’t help wondering whether those crazy years could have been better spent. I suspect that as even more years go past, I’ll be able to see more clearly just how formative those years actually were. Not just from the point of view that I obviously needed to live through those years, and to have those experiences, to get where I am now – a place I’m very happy to be – but also because I learnt so many important lessons, which I’m grateful to have learnt while still relatively young, and able to make changes. There are so many darker paths I could found myself on.